Today I brought my buddy Chandler Bolt on the show. Chandler is someone I met at a Fincon meeting in San Francisco. Then I saw him briefly again at Social Media Marketing World and knew I wanted to have him on the podcast. Chandler runs Self Publishing School where he teaches others how to write and self publish your first book in 3 months working 30 minutes per day. He’s the author of multiple best selling books and he’s an expert when it comes to going out on your own in the book business. Enjoy the episode! You’re listening to the my wife quit her job podcast, the place where I bring on successful bootstrap business owners and dig deep into what strategies they use to grow their businesses. Now today I’m happy to have my friend Chandler Bolt on the show. Chandler runs Self Publishing School where he teaches other people how to make a living selling books online, and today he’s going to teach us how he does it. But before we begin, I want to give a quick shout out to Privy who is a sponsor of the show. Privy is the tool that I use to build my email list for both my blog and my online store. Now, there are a bunch of companies that will manage your email capture forms, but I like Privy because they specialize in e-commerce stores. And right now I’m using Privy to display a cool wheel of fortune pop-up. Basically a user gives their email for a chance to win valuable prizes in our store. And customers love the gamification aspect of this, and when I implemented this form email sign ups increased by 131%. There are other cool things that you can do too. So for example let’s say you offer free shipping for orders over 100 bucks, well you can tell Privy to flush a pop-up when the customer has $90 in their shopping cart to ask them to insert one more item. But bottom line, Privy allows me to turn visitors into email subscribers, which I then feed to my email provider to close the sale. So head on over to Privy.com/Steve, and try it for free. And if you decide you need some of the more advanced features, use coupon code MWQHJ For 15% off. Once again that’s P-R-I-V-Y.com/Steve. Now I also want to give a quick shout out to Klaviyo who is also a sponsor of the show. Always blessed to have Klaviyo as a sponsor because they are the email marketing platform that I use for my e-commerce store, and I depend on them for over 30% of my revenues. Now Klaviyo is the only email platform out there that is specifically built for ecommerce stores and here is why it’s so powerful. Klaviyo can track every single customer who has shopped in your store and exactly what they bought. So let’s say I want to send an email to everyone who purchased a red handkerchief in the last week, easy. Let’s say I want to set up a special auto-responder sequence to my customers depending on what they purchased, piece of cake, and there is full revenue tracking on every single email that is sent. Steve: Welcome to the My Wife Quit Her Job Podcast. Today I brought my buddy Chandler Bolt on the show. And Chandler is actually someone I met at a FinCon meet up in San Francisco. And then I saw him briefly again at Social Media Marking World carrying a bunch of massagers and I knew I wanted to have him on the podcast. 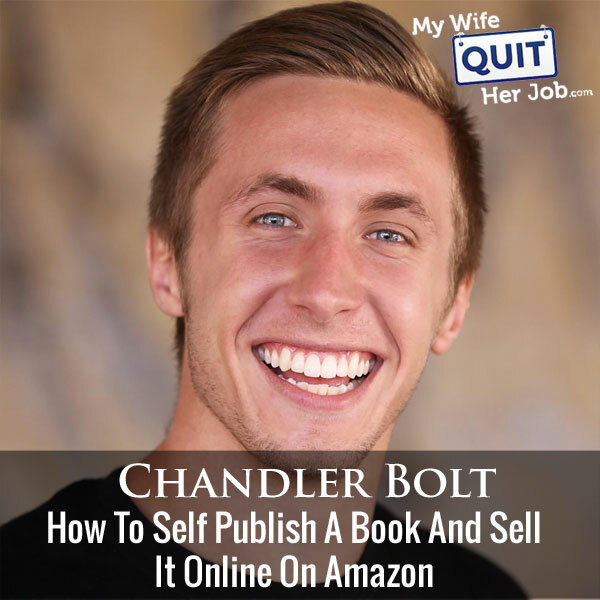 Chandler runs Self Publishing School where he teaches others how to write and self publish your first book in three months working just 30 minutes per day. And he’s the author of multiple best-selling books and he’s actually an expert when it comes to going out on your own in the book business. And with that, welcome to the show Chandler, how are you doing today man? Chandler: Hey Steve great to be here, thanks for having me. Steve: Yes Chandler we didn’t get a chance to chat that much, but it looked like you had places to go with those massagers. Chandler: Yes it’s that we were as Steve was mentioning, we were trafficking a version in Social Media Marketing World and our booth was next to a massage booth, they were fire selling these things in the end and I was caught in the middle as the transportation man for my team. And where we are — we were getting that boost setting up and having a good time. Steve: So Chandler I know your background story but the listeners do not. So tell us how you got into the self publishing business. Chandler: Yeah so my life changed when I wrote and published my first book. I was about 19 years old at the time believe it or not, and I was a C level English student and a college dropout. I was actually in the process of dropping out of school when I wrote and published my first book. And I always say that the book is the key that opens the door to Narnia, right? So if you see in the Chronicles of Narnia, it’s like this magical land that only exists and then they found this key, open this door, there’s this magical land. For me that was what happened with my book. So the book was the key that opened this door like this world that really only exists for published authors. So for me that meant you know the book made close to $7,000 in the first month, and a few thousand dollars a month in passive income month after month after month. Steve: Was this on Amazon or? Chandler: It was just on Amazon. And then kind of since then it’s marked a multimillion dollar business. I mean we’ve grown Self Publishing School to little over seven million dollars in the last three years, and that’s bill off the back. So at this point I’ve done, I’ve written and published six books and those really like they bring leads for our business, they obviously bring passive income on a month in month out basis. And then I think kind of the favorite, my favorite part is to see a bunch of people like in your audience, moms or people who say, hey I’ve accumulated all this knowledge over the course of my life whether that be my adult life, my entire life or my stories from being a kid, and I want to give back to others. I want to help people, impact them in a great way, but also like make some passive income or make some income that’s not tied to me training dogs for hours. And so that’s kind of what we’ve seen is our students, it really just opens up a whole another world for them and I think gives them a lot of confidence. And then also it’s not a bad thing to be able to create some words and then like a year from — or sorry like three years from now still be getting checks. Chandler: That’s X fifty bucks. I’m pretty pumped about that because that’s like some pretty good passive income. Steve: Can you give us an idea — you said you had six books out, how much passive income is that generating you personally? Chandler: Yeah so I think it’s about a couple thousand a month kind of in that range. Now we — and this is one of the things we talk about in the program, we structure books to fit your goals. So if your goal is to make as much passive income as possible, I’d be doing things very differently with my books. If your goal is to bring in business or leads for your business, then you’re going to structure it that way like really depending on whether it’s authority, depending on your goals you are going to do things quite differently from a marketing perspective. So for me I try to give away as many copies of my books as possible because I know that that lead is worth like exponentially more for me, and they’re way more likely to become customers of publishing school, spend a few thousand dollars with us. It’s like that’s worth way more for me. So I’m not optimizing for book royalties. I’m actually happy to spend money on Amazon ads and all that. It’s like even if I break even on the books I’m happy because I know all the while I’m getting a whole lot of free leads, or actually I’m getting paid to get leads from my book. Steve: Does that imply then that your books are free then for the most part? Chandler: No they’re not free on Amazon, but like I’ll give away the audio book which is a huge lead gen for us. I mean in the month of January this year we did cash, so I was just showing this to Social Media Marketing World a TNC we did what seems like 1,500 leads. Chandler: But that seemed also like – and then on credit that was a nice top because we were launching a product but seems still like 26 of those leads were from a book that I wrote and published like two or three years ago. So for me I’m doing more lead gen. Now of course we still sell them on Amazon. We do some free question thing book funnel sometimes and create promotions around that, but kind of anywhere on our site, it’s impossible not to get one of my books for free. We just use that as a big lead gen and also kind of customer acquisition too. Steve: So when you see a lead gen, these are like links within your book that lead to some sort of e-mail sign up form or something along those lines? Chandler: Exactly. There’s two main things and this will be worth the price of admission just right here. So this is one of my best marketing tips is if you’re using a book to grow your email list is give away audio or video, and the first five pages of the book for free. Now if you look on any of my books, so you can go to search published on Amazon or a book launch on Amazon or any of my books, you’ll see this. If you click the look inside feature, you’ll see that I give away the audio book for free. So imagine like how different our relationship is going to start off Steve where you’re browsing on Amazon, and some people think this, I think Chandler is an idiot, he doesn’t know that I can get this for free. But for me like I said a second ago that lead is worth way more than if they were to buy my Kindle book or print copy or whatever else. And oftentimes they do go onto to purchase other formats of the book, but they can actually opt in without even purchasing the book through that look inside feature. And then obviously if they’re getting into the book or if they purchase the book they can do the same. They can get the audio or some people like to do video, or the other thing is just resources mentioned throughout the book. Steve: Interesting, are your books about self publishing by any chance? Chandler: I think three out of six of them are. Chandler: The only books are and then obviously now that I’ve kind of been obsessed with helping people write, and publish their first book, that’s what my last three have been about and those three others, the most recent three. Steve: Can you kind of comment on just Amazon versus a traditional book publisher? Chandler: How much time do you have? Steve: Well just give me the pros and cons. Chandler: I run a company called Self Publishing School, so you can kind of guess which side of the equation I’m on, and what my beliefs are. But so here’s the cool thing Steve, so and how many people know this but over 70% of all books sold are sold on Amazon. Steve: Is that physical and digital? Chandler: I think so. I think so, I can double check that stat, so both are stats though, less than — what is it, less than 16% exactly of best-selling e-books are from traditional publishers. If you flip to the other side to author earnings, 70% of author earnings are from independently published authors. I mean they’re either with a really small publisher or they’re self published. So basically what’s happening is self publishing used to be the redheaded stepchild, right? It’s the thing that you only do when you can’t get a publisher, and you’re not legit if you don’t have a publisher. Now I’d say for 99% of people, it makes much more sense to self publish. And now obviously you’ve got to do it right, and the big objection is well, hey, I want to work with a publisher so they can do all this stuff for me. But the publisher is not going to market your book for you. That’s a common misconception. They’re going to ask you how you’re going to market it. It’s also going to take years of your life. You’re going to lose all your creative freedom and all of your control in the process. So unless you’re [inaudible 00:11:38], unless you’re someone who’s going to get a million dollar advance, then also you want to sell internationally, then it just doesn’t make sense anymore because all of the power is back in the hands of authors with the books been sold on Amazon and the process is just getting easier. Now there’s a lot of people who self publish the wrong way and who give self publishing a kind of a little bit of a bad name still. I say in five to ten years in my opinion the publishers are going to be out of business for the most part. You’re going to still have these big conglomerates just like you still have big cable conglomerates, just like you still have big record labels, but like they’re getting squeezed in a dying industry. And so for most people it just makes significantly more sense to self publish. Steve: Is it possible to get on like the New York Times bestseller list if you self publish or even in like a physical book store? Chandler: It’s possible to get in a physical bookstore. It’s difficult but it’s possible and especially Amazon has some physical bookstores so that they do that based on what sells the best. Chandler: It’s possible to get on the New York Times list, self publish is very hard. Now the thing a lot of people don’t know about the New York Times list is that it is an editorial list. Now this is highly problematic and it’s kind of a joke, and we’re going to write a blog post about this, how the New York Times list is a total scam. So editorial lists and so what that means is that if I’m an editor — so it’s meant to be a representation of books sold nation, right? Right now it’s a complicated algorithm that says, okay, not only do you need to sell in like all the zip codes across the country, it needs to be local bookstores, small bookstores, some on Amazon, some from like big box Barnes and Noble. You need to have like two to four thousand of those that are from bulk orders so like companies or events, or things like that. So you need to fill all this algorithm. Now the original intention was to keep people from gaming the system, but now, it’s just kind of people know the system so it still can be gamed. But then here’s the crazy part, so at the end of the day I find an editor at The New York Times, I could say, Steve I don’t like you or I don’t like your hair or the weather is bad outside, or my girlfriend just dumped me. And for any of those reasons I can keep you off the list. So it’s not a true bestsellers list. Now USA Today on the other hand that’s a true bestsellers list, Wall Street Journal, that’s more of a true bestseller list for hard copy books. So those are two higher of a list of higher integrity but obviously everyone is still obsessed with The New York Times because of past prestige from like 50 years ago. So that’s the one that is coveted and everyone still goes for, but I really think that trend is going to change. And here’s what kind of one final crazy thought on this, so here recently multiple people are being kept off the list who should have made it. So Michael Hyatt with his book Living Forward, he was the CEO and a publisher for 30 years, Thomas Nelson publisher. And they said hey, he’s like kind of in internet marketing land now, so we’re going to keep him up the list. He sold more than enough copies to be on the list. You need to sell about ten to 12,000 copies in week one, and I can’t really know what he sold but it was definitely more than that. Jeff Walker here recently, same deal, launches a book, it was actually years ago I guess now come to think of it. But he launched his book launch and in week one he sold enough to keep him off the list — sorry he sold enough to make the list, they kept him off. And then he reloaded and not many people can do this. Jeff could do this because he’s just incredible and he has this huge following. Chandler: In the dramas like this is scam. It just feels like what Uber is doing to the taxi industry. Chandler: I’d like to still — I feel like we’re the Uber of the publishing industry which is saying, hey, this is a horrible experience. It’s a stacked deck, it’s rigged against the author, and the public is totally blind to it or feels like they can’t do anything about it and we can. There’s another way and there is a better way but it still starts with awareness around the problem. Steve: So let’s talk about that. And so what does it take to become a successful author on Amazon? Steve: That’s like the number one question that most people have right, why not a traditional publisher, but anyways yeah. Steve: So let’s start from the beginning. So let’s have a book, let’s say I want to write about e-commerce, what are the steps, what should I be doing? Chandler: Yeah so I mean there’s a lot that goes into it. It’s kind of a three step writing process. I mean step one you’ll get clear on what you’re writing about and get clear on who you’re writing to. Steve: Well let’s take a step back. So you promise a book in 90 days, right? Steve: So traditionally that assumes a certain length of book, and I imagine it assumes a certain amount of writing that needs to be in each day and a certain amount of time for marketing and that sort of thing, right? Chandler: Exactly. So our target is fifteen to 40,000 words, somewhere in that range, but you do spend 30 minutes per day. Some people will just ship like lock themselves in a cave for a weekend or like in their office or whatever for a weekend and just write the book in a weekend. We’ve got some processes that kind of like speed that up. But either way yeah you got your link, you got your daily commitment, and then I think the big piece that a lot of people screw up besides the marketing, I mean I’m sure we’ll talk about that. I mean that’s what almost everyone in the marketplace just doesn’t understand and isn’t doing well. But the marketing starts before you even write the book, and not many people realize that. So whenever you start with a broad topic, it’s not going to do well. And so one of my first things and one of the first things like our coaches do when they get on calls with people is let’s get crystal clear on what this book is, who you’re writing to specifically and also who you’re not writing to. So I see people in this stage that they try to go way too broad. So they try to please everyone and they end up pleasing no one. Steve: So give me an example of one of your students for example that picked something that was too broad and how you narrowed it down. Chandler: Yeah, so there’s a couple of examples. So I’m trying to think, so one of them is this from a while back and she was just incredible, she’s had a whole lot of success since then. Her name is Kelsey Humphries. So I think she had a book, it was like live your passion, fulfill your dreams, and accomplish your purpose or something. I mean it wasn’t that, but it was along that chain. We started talking and I’m like what are you actually saying here, because I don’t know if I’m a potential reader, I don’t know if I’m a fit or not just glancing at this book. My general rule, and what we talk about as the litmus test is within two seconds I need to know what your book is about, and whether it’ll help me. So when I see the title and the subtitle, I need to know that instantly and you’re covered. If I don’t know that, that’s a problem. So, well I was like what are you really trying to do here, and I started talking to her. And it became clear that what she was really passionate about was helping people quit their day job. Later in the book she called it go solo, and I think the subtitle was how to quit the job you hate and start a small business you love. Steve: So along the lines of the example you just gave, like small business in itself is pretty vague, right? Steve: Like there’s a bunch of different types of small businesses, so would say would you recommend to actually niching down even more and like how to write a book business, or how to sell physical products online and that sort of thing in this specific example? Chandler: Yeah I would, I would. We could probably kind of layer further than that. I mean it does still speak to like how to quit the job you hate and start a small business you love and go solo. I mean it speaks to that. But for me I’m trying to go as specific as possible with all my books. So as an example, my very first book, The Productive Person, I think gosh the subtitle on that was like basically spoke to – I’m forgetting it right now, but it speaks to this like it is for entrepreneurs who struggle with work life balance and want to take back control of their schedule and these are productivity hacks and things like that. So now instead it’s like productivity hacks for entrepreneurs who’ve got work life balance wanting to take a control of their schedule. So like be specific and that’s what I recommend for others as well. One other just quick example that I’ll give is I was chatting with one of our students about her book idea, and we have a saying and I forget where I heard this but this isn’t original to me, but it says it’s easier to sell pain pills than it is to sell vitamins. So, essentially meaning that people will whip out their credit card when something is painful, and they’ll stand idly by instead of buying vitamins. No one wakes up in the morning and says, I can’t wait to buy vitamins today. A lot of people wake up in the morning and say, wow my back hurts, and they reach for pain medicine, right? So that’s what really moves the needle with anything. And now with books it’s specific. So she was writing a book about burnout, and the original hook and this just goes to show how important it is to really nail the hook from the beginning. The original hook was preventing burnout and kind of like steps to prevent burnout in the workplace. And I said this is great. You can actually talk about all the same things in the book, but what I would change the positioning is what to do once you burnout. Chandler: Because like no one wakes up and says, hey, I want to prevent burnout in my job. But a lot of people will wake up and say, wow I’m burned out and they’ll start goggling things in that moment or they’ll go on Amazon and they’ll search searching being it’s in that moment. So I think the two takeaways just for the audience here is number one, get as specific as possible. There’s no such thing as too specific. And then number two, how do you address this so that it’s — or how do you position this so that it’s solving real pain in the eyes of the reader and not just a vitamin solution. I just want to take a moment to tell you about a free resource that I offer on my website that you may not be aware of. If you’re interested in starting your own online store, I put together a comprehensive six-day mini course on how to get started in e-commerce that you should all check out. It contains both video and text based tutorials that go over the entire process of finding products to sell all the way to getting your first sales online. That’s interesting because there is a lot of bestselling books that don’t necessarily follow that philosophy and they do fine. But perhaps that’s just because the author is just so big already. Chandler: Yeah I’d say so, any that come to mind? Steve: For example I’ve just – yeah I know that’s cool. I was just thinking about like the Dover [ph] book like Win Bigly. It’s not really that descriptive of a title, but Scott Adams has such a large following that I guess it doesn’t even really matter what he writes at that point. Chandler: Yeah and there’s a whole what makes something get traction isn’t what makes it keep traction, right? So when I’m getting traction as a no name author, people need to know. Steve: Okay yeah that makes sense. Chandler: Tony Robbins is like money master of the game, okay cool, I need to get control of my finances. And even he launched a second book like a year later that was unshakable which is way more pain focused, so like how to prepare yourself for coming recession and that sort of thing. Okay so for someone who has a big audience like that, they can get traction with a couple of email blasts and TV appearances etc, and then what gives that book legs which is what gives every good book that sells thousands of copies legs which is it has to be a good book, right? Chandler: If you can come on a conversation with me and say, oh here is what it actually means and here is why it is good and you should get it, then sure it still takes more effort for that author to sell me on it, but there’s the virility in the word of mouth. But for a lot of first time authors, having a big title or a clever title is just not going to do it and it’s not going to help them get out of the gates. Steve: So let me ask you this, do you need to hire an editor, or can this all be done kind of solo, what would you recommend. Chandler: Solo I wouldn’t necessarily recommend it simply for the fact that I was just you know what I was just mentioning which is you need a good book and there’s a lot of people in my space in particular that just say, hey, just speak and get it transcribed and publish it. They’re just perpetuating crap and kind of into the universe. But that’s not my stance, but I think you need an editor. Now for my first book I didn’t have one, we self edited. And then I’ll even say to some people it’s like, hey, if you’re on a budget, call up your high school English teacher and they would love to help with this. And that would be like just a defining moment for them that one of their students went on to become a published author, like that’s pretty cool for them and also it can be helpful for you. Steve: What is that number approximately? Chandler: Yeah so how much does it cost to publish a book, or just for editing specifically? Steve: Just to publish the whole book. Chandler: Yeah so the whole book, I mean like 200 bucks on the very low end to like 1,500 a couple. I mean you can really spend as much as you want, and most people spend way too much. But we usually say, hey, 200 on the very low end like fully bootstrapped, and then on the higher end like 1,000 to 1,500 bucks. Steve: Are the bulk of those costs the editor? Steve: What are some elements of a good cover? Chandler: Yeah great question. So, there’s two or three things there. Number one I already mentioned, the litmus test of I need to instantly understand what the book is about. Number two, the title needs to be easily readable. And then number three it needs to stand out. So that means that the cover is clean, that means that the title is in the upper third of the book. And so I always talk about how there’s a difference between a good looking cover and a good selling cover. So designers will send you good looking covers, they just might not sell well. So it’s a big designer thing to like put the title on the bottom part of the book. Don’t do that; put it on the upper third because of natural eye path movement. People go to upper third and then read down into the right. So those are like the main things, make sure that I instantly understand what the book is about, make sure that it stands out. This is like your billboard in Amazon. So you’ll notice my book launch has like an orange cover. My book published, it’s blue, but it has red on it which the subtitle really pops of that. And then yeah the third thing is make sure that the title is easy to read and then it’s in the upper third. Steve: Are there any things that you do to kind of split test the book cover before it actually goes out? Chandler: I put everything up for a vote. Now I know this isn’t exactly like scientific and a lot smarter marketers than I am will say like, you should be spending money on AdWords or Facebook ads or things like that. I put it out for a vote to hopefully my target audience, but this also is kind of part of what we teach which is like building buzz before the book launch. So now that I’m getting all these people involved and by the time my book launches they feel like it’s their book that’s being launched because they’ve had input, and I’ll get a lot of good input on my covers. So I’ll send out on my e-mail list, I’ll post on Facebook and things like that, it just gives some really good feedback on the cover, and usually one, or two of them will jump out of people. Steve: So let’s talk about this a little bit. So let’s assume you have no audience whatsoever, what would you do? Would you try to build an audience before the book’s even written, like what is the process? Chandler: Yeah this is kind of a chicken and the egg conundrum and some people it’s exactly the question you asked, some people it’s should I start a business or do the book first? Should I get authority or publish the book? It’s kind of like chicken or the egg. So, for me personally, I was 19 years old and I had no following whatsoever when I launched my first book, The Productive Person. Now I had like I think a couple hundred friends on Facebook or something like that, and these were just like friends and family that I knew. And so I scrapped for every piece of feedback that I could get, every review I could get on my book, all those things. So if that’s you, then I mean in person, you can show people your book covers. If you’re on Facebook or any social media, obviously you can post that there. You can email it to people who would be your target customers or even family, friends, things like that. If you have absolutely no one in your life that could give you feedback, for most people I found that that’s not the case, for some people it is. But definitely for me I had no – I had 4,000 [inaudible 00:32:03] list off of the book, but that was just people who basically purchased the book and that was in like the first six to eight months. But I had — that list did not exist before I published the book. Steve: Interesting okay. So let’s talk about the different options on Amazon, and then what is the launch process like for you assuming you have no audience whatsoever? Chandler: Yeah so if you were — when you say the different options on Amazon, what do you mean by that? Steve: KDP, KDP select, stuff like that. I mean if you could define those first and then what you would recommend for someone brand new doing this. Chandler: Yeah, so there’s a few different options for publishing. So obviously you’re going to have the option to do Kindle, option to do print and the option do audio book. Now all of these are easier than you would think, and Amazon has made this like there’s no upfront cost and like say for print, for print copies or physical copies, they can print and ship on demand. So you’re not going to get stuck with 1,000 copies in your garage that you paid a bunch of money for. So there’s multiple options from a type of book perspective, so there’s ACX for audio books, there’s CreateSpace for print books and there’s KDP, Kindle Direct Publishing for e-books. Now as far as a launch plan for people with no audience, so there’s a couple of things that I do. Number one is I go to launch team. Now this is simply a small group of people who support the book, this could be friends, family members, coworkers, colleagues, I mean the moms at your son’s football practice, I think this could be anyone. It is five, 15, 50 people and that’s a group of advocates. And I think we have a post on the blog about this, or it’s definitely in my book published. It goes into like more detail like, hey, what’s a launch team, how do you run it, all that stuff and the [inaudible 00:34:00]. So like the 10,000 foot view is it’s a group of people that support your book. They’re going to leave a review when it launches, and they’re going to get a free digital copy of the book ahead of time and I’m going to put their name in the book in the acknowledgments at first for that. Steve: Do they have to actually buy the book in order to be able to leave a review that has an impact on the sales? Chandler: They can download it for free in the free period which I recommend for a lot of people who don’t have an audience. I’ll do a two day free period before I actually launch the book to get downloads, to get reviews. We call it like the stealth launch, so it’s like it’s lying on Amazon just no one besides my launch team knows it yet. And then we do our proper push after that. It stays like two days and they can download it for free or they can also purchase it like for 99 cents or something if you’re discounting it when you first launch. And so the launch team is the biggest thing that there is if you do nothing else, it’s the 80/20 of a successful book launch. And then the free to page strategy that I just kind of mentioned is something that I also recommend for people who don’t have an audience. Steve: I’m sorry so the strategy here is just to get as many reviews as possible in those first two days during the free period, right? Chandler: Exactly, and then I’ll submit it to a lot of free Amazon free sites. So these are sites that are built up around this. Steve: Can you give us an example of one? Chandler: Yeah, gosh I’m thinking of around 99 cents sites, so there’s BK [inaudible 00:35:29], there’s Awesome Gang, there’s some other ones. I’m trying to think of then the free sites, I can’t think of any off hand. We’ve got like a whole rolodex of these things. Steve: So, these are sites that just distribute free books? Chandler: Yeah, it’s like so Buck Books is — that’s when books are 99 cents so a buck, but then gosh it’s been so long since I’ve been in the weeds for my books personally. I mean I have some people on my team who handle most of this, so I’m drawing a blank on the free sites right off hand, but just know there’s a ton of them. And that helps with a ton of free downloads or to the free store and we transition to the paid store, and then we’re doing promos and stuff there. So that’s kind of what I recommend is you can rank pretty high, you can get a lot of downloads, you can get a lot of leads for your business if that’s what you care about, all those things pretty early on in the process from that kind of free to paid strategy. Steve: What about pricing? So let’s say you’re done with the free part, you’ve gotten like let’s say 50 reviews from your launch team and you want to start charging for it, are there any strategies there on pricing? Chandler: Yeah, so I’ll switch over from free to paid at 99 cents, and then I’ll – and this is just for a Kindle book obviously. Chandler: And then I’ll stair step up the pricing like one week at a time. So there’s urgency around that and I have an excuse to keep talking about the book. And then I’ll land on a sweet spot for the Kindle book. Maybe that will be 2.99 on the lowest up to 5.99 or potentially even higher. Again it all depends on your goals, like if I want to sell or if you want to sell a lot more physical copies, then obviously I’ll price the Kindle book at like 9.99 which is the highest that you can price it without taking a haircut from a royalty perspective. So if you go over 9.99, you start making less royalties. Steve: What is Amazon’s take actually at the top price tiers? Chandler: Oh yeah I thought you’re about to say why would Amazon do that which would both be great questions. So it’s from 99 cents to 2.99 is you keep 35% of royalties, and then 2.99 to 9.99 you keep 70% of the royalties. So that’s the sweet spot, that’s where they want books to be priced. Obviously they’re highly incentivizing that. And then above 9.99 I think it drops down to 35% again. Steve: I see interesting. So they want cheap books in their library? Chandler: Cheap and not too cheap. Chandler: They’re like hey we don’t want our e-book store full of crappy e-books that are selling for 99 cents, at the same time we don’t want people pricing e-books so high which the publishers were trying to do when Amazon first came out, because they’re like hey, we’ve got a traditional model, we don’t want disruption. So let’s just price these e-books way high like we would for other stuff. And then what happens when no one buys e-books and then print books keep selling and then it’s like so they want it to happen in that sweet spot which is they say hey, we think this is a good value for the customer, it’s also fair compensation for the authors. And so there’s kind of a happy medium here without the publishers just giving them a big FU and charging it like 15 bucks for an e-book just so that you buy more of their print books. Steve: Do you recommend if this is your first book doing an audio version of the book as well? Chandler: I do, I really do. It’s actually a pretty good earner for me. And this is totally dependent on genre is my audio book, and I highly recommend it especially if you’re doing any sort of business beyond the book, because think about it if you didn’t — and now you can do it for relatively inexpensive to hire someone. It’s actually cheaper to hire someone else to do it than yourself. And if you do like I did and I went to the studio and stuff, I mean you could do a DIY and we have some — I think there’s blog posts or training, or something around that, like the DIY side of things on how to make an audio book. And you can certainly do that for cheaper. But either way you’ve got an audio book that’s — I mean you’re spending hours with prospective customers. So now I like for example publish, when people get to the end of that we’ve spent hours together, so how much more likely to you think they are to go on and do business with me to check out the podcast, check out the blog, share any of that. They’re in our world now and it feels like we have a personal relationship. Steve: That implies then that if you narrate it yourself that’s an advantage, right, because they hear your own voice? Chandler: I think it is. That wasn’t my stance with my first ones because I was like I can’t be bothered. It’s not like I’m wealthy. I think it took me a day and a half to narrate my book. So it’s definitely more time consuming to do it. I’m so glad I did it. Now again I paid more because I went to the studio and stuff, but I’m so glad I did it because I just think you build this much deeper connection with the audience. For example, I remember listening to the Five Love Languages by Gary Chapman. It’s read by him, and that sticks out to me and I thought like I know him as a person because I’ve listened to that book similar to like Brian Holliday reads all of his e-books, and like [inaudible 00:41:10] his audio books and things like that. So I just think you build a deeper connection. Steve: And it’s just like podcasting, right? Steve: Tell them this is Steve for an hour. Okay, hey Chandler, I want to actually – we kind of stepped off the whole timeline, like you had a 90 day timeline. How much of that is writing, how much of that is promotion, editing and that sort of thing? Chandler: Yeah so there’s you know we were ideaiting [ph] and getting clear on the idea and mind mapping, outlining etc for I think about, gosh I think it’s a week to two weeks. Then 30 to 45 days of writing, and then a month or so of promotion or build up. So that’s kind of the general 10,000 foot view of the timeline. Steve: Okay and so the promotion and build up part, if you don’t have an audience there’s not much there, is there? Steve: Oh the launch team got it, got it okay. Chandler: We talk about building buzz. I mean so like really just let it be known that you’re writing this book. One of the big mistakes I see people make is they go in their writer cave, and then they come out and say, hey everybody, I’ve got this book, buy my book, buy my book, buy my book. And they just beat people over the head with it for like a couple of weeks and then go back into the writer cave. I’m just not a fan of that. I would rather for weeks coming up like you know I’m taking like get a few pictures, I’m like you know screen shot in a coffee shop selling people the book cover, like really building up so that by the time it launches, it’s anticipated. It’s kind of like building that red carpet event where people feel like they’re behind the scenes instead of just surfacing like a submarine the week of your book launch. Steve: Do you ever do any paid advertising? Chandler: Yeah we do. We do mostly Amazon ads; those are working pretty well for us, AMS ads. Yeah that’s worked pretty well. I don’t do much Facebook ads, there are some tricky stuff with Amazon and Facebook’s Terms of Service, plus tracking is tough. There’s essentially workarounds, yes and there are people that teach courses on stuff. It is a bit of a gray area from the terms of service perspective for both sides. So I don’t really touch that. I mean also our Facebook ads are way more profitable and all of our other ads are way more profit when I’m sending them to things that we do and then looping the book in instead of going straight to the book. Steve: Okay and then in terms of Amazon ads, does it work similar to physical products where you bid on keywords? Chandler: Yeah it is. There’s two types, there are sponsored ad and promote — I forget what they call them right now, but I think it’s sponsored and promoted. And yeah they’re a little bit different. But yeah you can basically do keywords and they’ll show up based on those keywords. Steve: Okay and then is there a particular type of genre or category of books that tend to be more profitable than others? Chandler: Yeah so there’s — this is kind of a — are you baseball fan? Steve: Not really actually, I like basketball. Chandler: Do you know how baseball works? Chandler: Okay cool. So I might lose most of the audience here, maybe, maybe not. So baseball analogy is nonfiction, is base hits, fiction is home runs. Chandler: Like sluggers in baseball, they hit home runs and they also strike out a lot with this. A base hit, even someone with a high on base percentage, they are just going to hit a bunch of base hits. So nonfiction it’s easy to get a win, and the probability is higher that you’re going to get a win. That win is just not going to be a go and it’s not to be as big of a win, because all – not all the money but a lot of the money on Amazon is in fiction books. And now this is crazy guys like you and me right Steve because we’re more like in the nonfiction world, self-help, probably like on the self-help book nerd side of the equation. Chandler: I’ll speak for myself. I read a lot of books and business books and sales and like all that stuff, and I can tell you the last time I read a fiction book it’s literally been probably since I was like in middle school. But that’s not normal, the majority of the population they read fiction books as a source of entertainment. Chandler: This is hyper audiences of fiction book buyers who just buy like one to two books a week and just devour them, right? So if you go on Amazon, the top 100 on all of Amazon, they’re pretty much all fiction books. And actually funny enough, they’re like a bunch of erotica books like fiction erotica, like a guy with his shirt off with abs on the cover. It’s like a top selling a lot of that selling books in Amazon are in that genre specifically. Steve: Interesting okay. So I guess it just depends on — like for your customers at least it just depends on what they want to write about. Chandler: Totally yeah we have like fiction coaches and children’s book coaches and nonfiction and different courses for fiction or nonfiction and it’s kind of like a “choose your own adventure.” And I will say this, and this is kind of as we’re going in the homestretch here I think something that will be helpful, if you’re considering writing two books, write nonfiction first because it’s easier, it’s a whole lot harder. Steve: Interesting. And I would imagine if you’re doing fiction, your audience probably matters a lot more than a nonfiction book, right? Chandler: Yeah oh yeah and there’s just all these skills that you have to have as a fiction author that you don’t have to have as a nonfiction author as much. You can be a mediocre writer; if I’m telling you amazing stuff in the book you’re happy at the end of that book. You can say, hey that wasn’t very well written, but I learned a bunch. You can chance, not the case in fiction. I need to be a good storyteller, I need to use consistent voice, I need to develop characters, develop the plot, develop conflict. I need to be — there’s a whole story arc that needs to happen. And if it rolls for like two or three chapters in a row, you’re going to put the book down and not be in. It’s like a Netflix series almost. It’s like I need to be able to keep you in that story for a longer period of time. Steve: Okay interesting. Hey Chandler, we’ve been chatting for a little longer than I promised to actually. Where can people find you if they want to learn more about the self publishing? Chandler: Yeah so self-ppublishingschool.com is our main site, or you can go to self-publishingschool.com/free. We’ve got some free training there that kind of builds on exactly what we were just talking about in this episode. So, three steps to writing the book, how to get clear on your idea, on how to launch it successfully, talk about launch team more in-depth, all that good stuff. Steve: Okay and then the time frame is on the order of 90 days, and from what I read before you guarantee some sort of bestseller status, what does that mean exactly if you wouldn’t mind defining it? Chandler: Yeah so it’s number one at least one category on Amazon. So that’s actually our best seller guarantee, and now this is not underwater basket weaving or some obscure category on Amazon, this is a proper category with more than one book in it. It’s like real bestseller. Steve: Okay awesome. Well Chandler I really appreciate you coming on the show. I’m sure the audience will learn a lot from this. Chandler: Thanks Steve. Thanks for having me. Hope you enjoyed that episode. Chandler is one of the foremost experts in the online book publishing business, and I hope you got a lot out of the episode. For more information about this episode, go to mywifequitherjob.com/episode211. I also want to thank Privy for sponsoring this episode. Privy is the email capture provider that I personally use to turn visitors into email subscribers. They offer email capture, exit intent, and site targeting tools to make it super simple as well. And I like Privy because it’s so powerful and you can basically trigger custom pop ups for any primer that is tied to your e-commerce store. If you want to give it a try, it is free. So head on over to Privy.com/Steve, once again that’s P-R-I-V-Y.com/Steve.